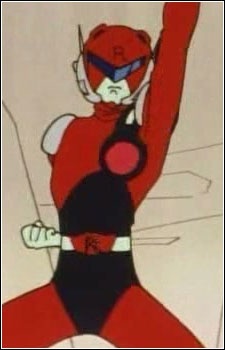 Redman was sentai hero who appeared in episode 032. He appeared in the amusement part show Redman Show: Monster Fighter Redman, which Naru and Umino went to see. Zoisite had modified the Kurozuishou so that it could transform ordinary humans into youma, hoping to transform Naru into a youma and lure Sailor Moon into the open. He followed Naru to the Redman show. When he used the crystal, he missed and the crystal's beam hit the actor playing Redman instead. He quickly transformed into the youma Akan, and began throwing marimo (green algae) balls at the audience members, who were engulfed in them when they were hit. Fortunately, Sailor Moon soon arrived and healed Akan, causing him to transform back into the actor playing Redman. The show soon resumed, with the audience members believing that the brief battle with Sailor Moon was part of the act.